It is a big, corpulent pigeon with long toes. The female is a little smaller than the male but it is not easy to distinguish them. Trocaz Pigeon is dark grey overall with red bill and toes. At a close view one can observe its stripped silvery patch on neck-side and its pinkish chest. When flying its white band on the tail and its dark grey underwings as well as whole body are its distinctive features. 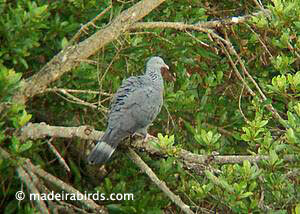 The Madeira Laurel Forest contains almost all of the Trocaz Pigeon's natural food resources though sometimes it is seen in some adjacent agricultural lands, where it looks for cabbages. 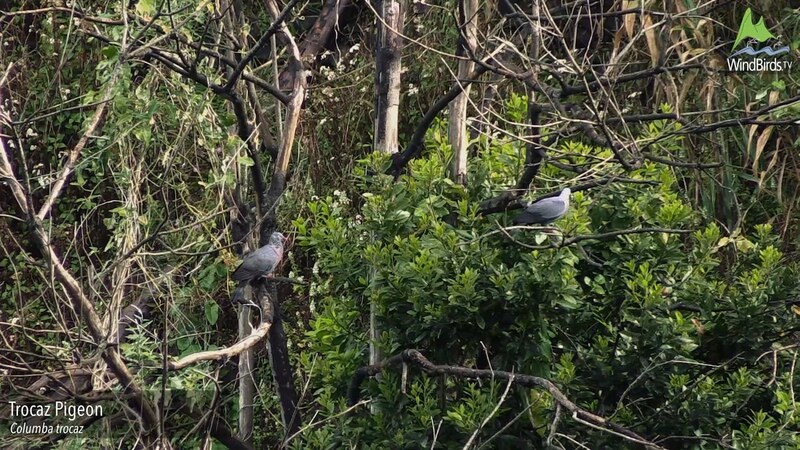 In Madeira there is only the Rock Dove or Feral Pigeon that might be seen together with the Trocaz Pigeon though the bigger size and dark grey colour of the latter is very distinct. Breeding:This Madeira endemic species builds its nest in small and discreet caves on the rocks or sometimes in trees but these are more vulnerable to rain and wind damages. It lays a single egg in one or two annual broods and both parents participate in the incubation and feeding of the chick. Diet: Feeds on Laurel trees’ berries (Laurus novocanariensis, Ocotea foetens) and on the leaves of several Madeira endemic bushes such as Teline maderensis, Phyllis nobla, Erysimum bicolour between others (Marrero, Oliveira & Nogales, 2004). Outside the Laurel Forest it mainly eats cabbages. 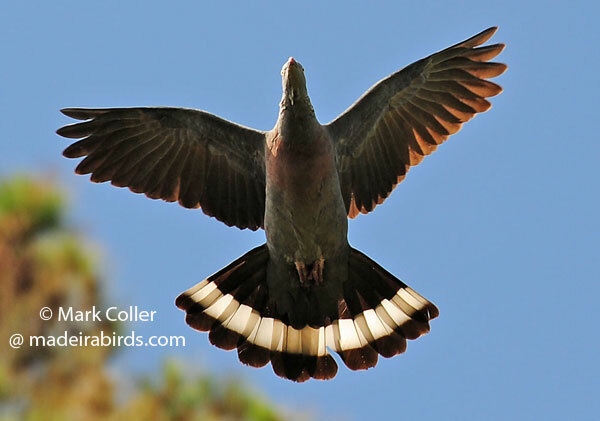 Trocaz Pigeon Columba trocaz is an endemic bird of Madeira, first described in 1829 by Heineken, that lives on the northern mountain slopes and in some secluded places of the southern coast of the island where Laurel forest prevails. 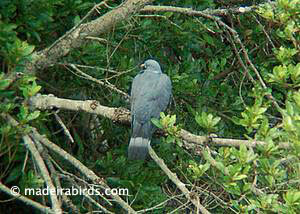 The also called Long-toed Pigeon once existed in Porto Santo but nowadays is restricted to Madeira Island. In the past, it was highly affected by the destruction of its habitat. Today this species is not seriously threatened as all Laurel forest areas have been considered Integral or Partial Nature Reserves under the jurisdiction of the Madeira Natural Park - Parque Natural da Madeira. 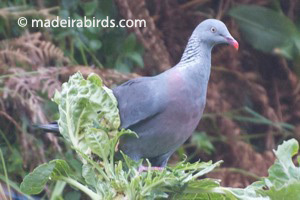 Although this species is associated to the Laurel forest as it feeds from the berries of the big laurel trees and the leaves and flowers of other small plants, this large and long-toed pigeon is frequently observed in the cultivated lands near the forest, where it seeks food and usually damages crops, especially cabbages. For this reason Trocaz Pigeon became unpopular and was hunted by the population. 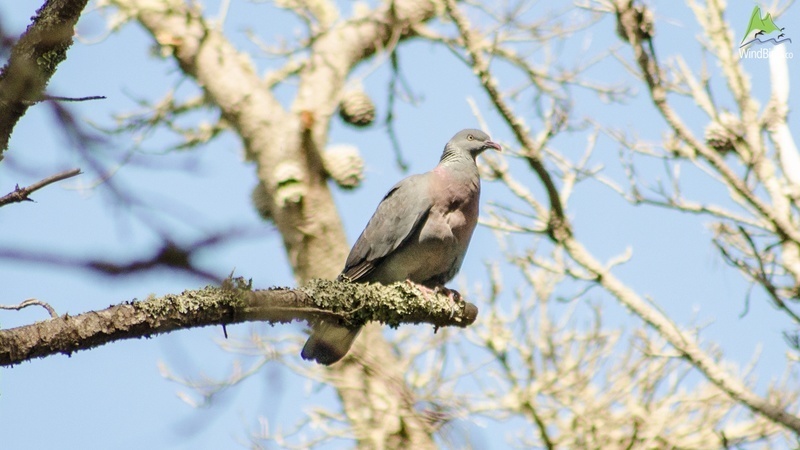 In 1984 and 1985, the authorities were pressured to authorise the hunting of this species so the farmers could control the damage this pigeons made on cabbage patches. This went on until 1989 when Trocaz Pigeon population was decreasing significantly and so the species gained a strict protection status. 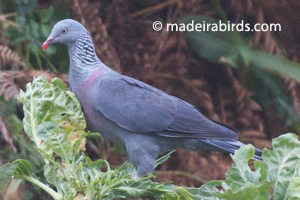 In 2009, to face the constant complaints of the farmers, the Environment & Natural Resources Board of the Madeira Government - Secretaria Regional do Ambiente e dos Recursos Naturais - officially allowed the Madeira Natural Park to shoot Columba trocaz as a species’ corrective measure. About 1000 pigeons were killed that year. On the 17th of April 2012 this authorisation was again issued for another year and in 2013 it was again extended until the 17th of April 2014. During the decades in which these birds were victims of poisoning and killing, the population size was drastically reduced, and some authors say that in 1982 there were only a few more than 500 birds but given the amount of birds hunted this estimation rose to over a 1000 in 1985 (Zino & Zino, 1986) . After hunting was considered illegal, the first census with a complete and specific methodology was done in 1986 and from the results it was concluded that there were about 2700 birds. After that, this type of study continued and was done regularly every four years. 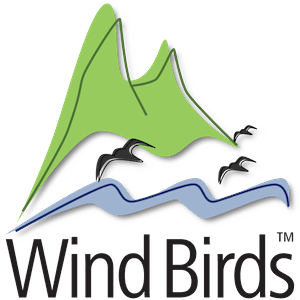 According to the 1995 census, the population consisted of about 10400 birds, in 1999 more than 8400, in 2003 only 7000 birds and in 2009 between 8500 and 10000 individuals. The Madeira Natural Parks, the institution also in charge of shooting the birds, says to keep doing these census but since 2009 the results are not published or are publicly inaccessible.